Kenneth Max Copeland (born December 6, 1936) is an American televangelist, author, public speaker, and musician associated with the Charismatic Movement. He has been identified as preaching a prosperity and abundance message, commonly referred to as the prosperity gospel, which has been criticized by ministers from various denominations. His Tarrant County, Texas-based Kenneth Copeland Ministries (KCM) advocates daily application of the "Word of God" from the Bible. KCM teaches biblical faith, love, healing, prosperity and restoration through diverse media including television, internet, books, CD and DVD. KCM's motto is "Jesus is Lord" from Romans 10:9. Kenneth Max Copeland was born in Lubbock, Texas, to Aubrey Wayne and Vinita Pearl (née Owens) Copeland. He was raised in West Texas near a United States Army Air Forces airfield, which inspired him to become a pilot. Copeland married Ivy Bodiford in October 1955 and became the parents of Terri Copeland Pearsons; they divorced in 1958. Kenneth married Gloria (née Neece) on April 13, 1963. They are the parents of John Copeland and Kellie Copeland Swisher. Gloria and the Copeland children work for KCM. Kellie preaches throughout the United States, as does Terri, who also preaches at Eagle Mountain International Church, which is pastored by her husband, George Pearsons. Prior to his conversion to Christianity in November 1962, Copeland was a recording artist on the Imperial Records label, having one Billboard Top 40 hit ("Pledge of Love", which charted in the Top 40 on April 20, 1957, stayed on the charts for 15 weeks, and peaked at #17). Following his conversion, Copeland devoted his life to the gospel and ministry work. In the fall of 1967, he enrolled in Oral Roberts University, where he soon became pilot and chauffeur to Oral Roberts. For decades, Copeland's ministry has held three-to-six-day conventions across the United States. The number of longer set conventions has waned in recent years, although KCM still holds an annual Believer's Convention in his hometown of Fort Worth, Texas, during the week of July 4. Kenneth and Gloria Copeland, along with ministry friends including some family members, also preach at other conventions and conferences throughout the world. These events stream live on Copeland's website, kcm.org, as well as being shown on Christian television stations such as God TV and the Daystar Television Network. Portions of recorded conferences are shown Sundays. The Monday through Friday television broadcasts feature a Copeland family member, either alone or with another minister, discussing subjects from The Holy Bible. Most of these episodes are available on BVOV.tv. In July 2015, KCM launched the Believer's Voice of Victory Network on channel 265 of Dish TV. Kenneth Copeland Ministries is located at 14355 Morris Dido Road, Fort Worth, TX 76192 on 33 acres (13 ha), a property valued at $554,160 in 2008 by Tarrant Appraisal District. The site includes the Eagle Mountain International Church, television and radio production facilities, warehouse and distribution facilities, residences for the Copeland family, and Kenneth Copeland Airport. Approximately 500 people are employed by KCM. John Copeland is the ministry's chief operating officer. KCM also owns a 1998 Cessna 550 Citation Bravo, which it received from a donor in October 2007 and is used for domestic flights, and a 2005 Cessna 750 Citation X, which it uses for international flights. It also is restoring a 1962 Beech H-18 Twin, which the ministry plans to use for disaster relief efforts. In February 2007, Copeland was accused of using his ministry's Citation X for personal vacations and friends. The Copelands' financial records are not publicly available, and a list of the board of directors is not accessible as these details are protected but known confidentially by the Internal Revenue Service. Responding to media questions, Copeland pointed to what he asserted was an accounting firm's declaration that all jet travel complies with federal tax laws. In December 2008, KCM's Citation Bravo was denied tax exemption after KCM refused to submit a standardized Texas Comptroller form that some county appraisal districts use to make determinations, which would have required making public the salary of all ministry staff. KCM subsequently filed suit with the Tarrant Appraisal District in January 2009 and its petition to have the aircraft's tax-exempt status restored was granted in March 2010. Kenneth Copeland Ministries has taken advantage of a Federal Aviation Administration program that keeps flights private from tracking websites, and the ministry owns five such aircraft whose flights are kept private, including the Cessna 750 Citation X note above and a North American T-28 Trojan. United States Senator Chuck Grassley has questioned some of the flights taken by these aircraft, including layovers in Maui, Fiji, and Honolulu. The ministries say that the stopovers were for preaching or for allowing pilot rest. According to the Washington Times, Kenneth Copeland (and another televangelist Jesse Duplantis), has defended his use of private jets as a luxury means of travel, arguing that commercial planes are full of "a bunch of demons." 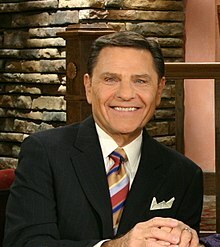 According to The Christian Post, Kenneth Copeland Ministries was criticized in 2010 for failing to fly disaster relief missions to Haiti after allegedly promising an aviation relief assistance program called Angel Flight 44. The Angel Flight 44 ministry was announced by Kenneth Copeland Ministries in 2006 and the ministry attempted to raise money to fund it. Richard Vermillion, co-author of a book on Angel Flight 44 commissioned by Kenneth Copeland Ministries, said that Copeland promised to form the aviation ministry but now believes it was never created. A spokesperson for Kenneth Copeland Ministries, Stephen Swisher, told The Christian Post, "This was not a specific promise with a time line attached", and said that the money was spent on airplane repairs, and that the airplane was "not in airworthy condition" and had "structural issues.". In late November 2007, Mike Huckabee, a 2008 Republican presidential primary candidate, made six appearances on Copeland's daily television program Believer's Voice of Victory, discussing "Integrity of Character." Huckabee, an ordained Baptist minister, was appearing on Copeland's daily broadcast to promote his book, Character IS the Issue: How People with Integrity Can Revolutionize America. Through the years, Copeland has invited many church pastors and evangelists to appear on his daily program to discuss their respective books. Subsequently, in January 2008, the Huckabee campaign paid for use of Kenneth Copeland Ministries' facilities for a fundraiser. The fundraising at the church was criticized by the Trinity Foundation. As a result of the Huckabee appearances, Kenneth Copeland Ministries was one of six approached by the United States Senate inquiry into the tax-exempt status of religious organizations. The Copelands responded with a financial statement and created a website, Believers Stand United, to help explain their perspective. In 2013, a measles outbreak (20 confirmed cases as of August 26) in Tarrant County was attributed in the press to anti-vaccination sentiments expressed by members of the Copeland Ministries. The church denied making any such statements and urged members to get vaccinations, even offering free immunizations through the church itself. Pastor Terri Copeland Pearsons, who is Kenneth Copeland's daughter, offered free vaccination clinics and advised those who did not attend one of the clinics to quarantine themselves at home for two weeks. In a statement on the church website, Pearsons said she was not against immunizations, but also raised concerns about them. "Some people think I am against immunizations, but that is not true," the statement said. "Vaccinations help cut the mortality rate enormously. I believe it is wrong to be against vaccinations. The concerns we have had are primarily with very young children who have family history of autism and with bundling too many immunizations at one time. There is no indication of the autism connection with vaccinations in older children. Furthermore, the new MMR vaccination is without thimerosal (mercury), which has also been a concern to many." Kenneth Copeland and his wife, Gloria Copeland, were featured in a 2015 episode of Last Week Tonight with John Oliver that gained media attention. Comedian John Oliver criticized the Copelands for using tax laws to live in a $6.3 million mansion as the parsonage allowance for their home is not subject to income taxes, for using church donations to buy a $20 million jet that was used for trips to a ski resort and a private game ranch, and for promotion of healing through faith and skepticism of medicine, which Oliver highlighted with a video of Gloria Copeland saying that doctors give patients "poison that will make you sicker" and that the church is an alternative to medical treatment: "Which do you want to do? Do you want to do that," Copeland asked of the doctor's "poison" treatment, "or do you want to sit here on a Saturday morning, hear the word of God, and let faith come into your heart and be healed?" In 2009, Copeland's $3.6 million jet was denied tax-exempt status, opening up a possible investigation into the church's expenses; Copeland failed to disclose the salaries of his directors. In 2008 the ministry stated it owned five airplanes, one of which is valued at $17.5 million. Copeland's ministry bought a multi-million Gulfstream V jet airplane and Copeland thanked his followers and Jesus for buying it when it was delivered at the Fort Worth airstrip, wearing a pilot jacket and sunglasses. The jet was bought from filmmaker and businessman Tyler Perry. Copeland had earlier stated that flying commercial was like entering "a long tube with a bunch of demons", and defended the use of private jets as it allows for prayer in privacy 'as the Lord leads' and avoids demonic influences. Now, the church is asking another $17 or $19.5 million for the building of a hangar, upgrading the runway and maintenance. Copeland's and other televangelists' use of private jets and other lavish houses and vehicles has been criticized. ^ "8 Richest Pastors in America". beliefnet. Retrieved October 1, 2018. ^ Rosin, Hanna (December 2009). "Did Christianity Cause the Crash?". The Atlantic. Retrieved January 4, 2015. ^ "Kenneth Copeland Ministries - About Us". Kenneth Copeland Ministries. Retrieved April 18, 2018. ^ "Texas Birth Index, 1903-1997". www.ancestrylibrary.com. Retrieved April 18, 2018. ^ "Kenneth Copeland". biographyministries.com. 2008. Archived from the original on October 16, 2008. Retrieved December 17, 2008. ^ Gorski, Eric (July 27, 2008). "AP IMPACT: Relatives of televangelist prosper". NewsOK.com. Retrieved April 18, 2018. ^ "Lubbock County Marriage Certificate". erecord.co.lubbock.tx.us. Retrieved April 18, 2018. ^ "Kenneth and Gloria Copeland, The Untold Story". KennethCopelandBlog.com. August 1, 2010. Retrieved March 7, 2016. ^ Whitburn, Joel (2000). The Billboard Book of Top 40 Hits. Billboard Books. p. 151. ISBN 9780823076901. ^ "ORU alumni". Archived from the original on February 10, 2009. Retrieved April 16, 2017. ^ "dish general channel linup" (PDF). dish. Retrieved March 29, 2016. ^ "Analysis: Copeland's religious empire benefits his family". USA Today. July 27, 2008. Retrieved January 29, 2014. ^ "Kenneth Copeland Airport FBOs (Fort Worth, TX) [4T2] ✈ FlightAware". Retrieved April 16, 2017. ^ "FAQ: Why does Kenneth Copeland Ministries own private aircraft? What types of aircraft are they? Why don't Kenneth and Gloria fly on commercial airlines?". Believers Stand United. Archived from the original on November 4, 2013. Retrieved May 14, 2013. ^ a b c "Jet flight records spur Copeland ministry questions". WFAA-TV. February 28, 2007. Archived from the original on September 7, 2007. Retrieved October 17, 2007. ^ a b "A Victory for Church Freedom". Church Law Group. March 11, 2010. Archived from the original on November 4, 2013. Retrieved May 14, 2013. ^ Barbee, Darren (February 25, 2009). "Appraisal district sued over tax exemption for private jet". Fort Worth Star-Telegram. pp. B07 Metro. ^ "TAD, Copeland ministry settle suit over tax-exempt jet". Fort Worth Star-Telegram. March 10, 2010. ^ a b c "Televangelist, college boosters, Hooters on stealth fliers list - USATODAY.com". Retrieved April 16, 2017. ^ http://www.washingtontimes.com, The Washington Times. "Kenneth Copeland, Jesse Duplantis defend private jets: Commercial planes full of 'demons'". Retrieved April 16, 2017. ^ a b c d "Televangelist Kenneth Copeland Blasted for 'Unfulfilled Promises'". Retrieved April 16, 2017. ^ a b "Plate passed for Huckabee at ministry site". Arkansas Democrat-Gazette. January 29, 2008. Retrieved December 17, 2008. ^ The investigation found no evidence of the Copelands making personal profit from financial donations. Zoll, Rachel (July 1, 2011). "Televangelists escape penalty in Senate inquiry". www.nbcnews.com. Retrieved February 11, 2013. ^ "Texas Measles Outbreak Linked to Church Led by Kenneth Copeland's Daughter; Infection Spreads to Congregation, Staff, Day Care". www.christianpost.com. Retrieved December 22, 2017. ^ "Texas Megachurch At Center Of Measles Outbreak". NPR.org. Retrieved December 22, 2017. ^ News, A. B. C. (August 27, 2013). "Texas Church at Epicenter of Measles Outbreak". ABC News. Retrieved December 22, 2017. ^ "Last Week Tonight with John Oliver: Televangelists (HBO)" (16 August 2015). YouTube. Retrieved August 18, 2015. ^ Ohlheiser, Abby (August 17, 2015). "Comedian John Oliver takes on the prosperity gospel by becoming a televangelist". The Washington Post. Retrieved August 18, 2015. ^ Locker, Melissa (August 17, 2015). "John Oliver Becomes a Televangelist and Finally Starts His Own Church". Time Magazine. Retrieved August 18, 2015. ^ Stern, Marlow (August 17, 2015). "John Oliver Exposes Shady Televangelists Fleecing Americans For Millions". The Daily Beast. Retrieved August 18, 2015. ^ Burnett, John. "Can A Television Network Be A Church? The IRS Says Yes" (1 April 2014). NPR. Retrieved August 18, 2015. ^ "Senate audit critical of TV preacher Kenneth Copeland". WFAA. Dallas, Texas. January 7, 2011. Archived from the original on October 19, 2015. Retrieved August 18, 2015. ^ "Tax-Exempt Status For Televangelist's Jet Denied". Americans United. Archived from the original on January 20, 2018. Retrieved December 25, 2018. ^ a b c "Kenneth Copeland Acquires New Gulfstream V Jet, Seeks $19.5M for Upgrades and Maintenance". Christian Post. ^ a b c "'Jesus bought this': Delighted televangelist Kenneth Copeland giggles with glee as he unveils new $3million private jet paid for by donations from his followers". Daily Mail. ^ "Kenneth Copeland Ministries Ups Being a Scumonaut by Bragging About New G5 Jet". Pulpit&Pen. ^ "Kenneth Copeland Loves His New $36 Million Jet". Patheos. Archived from the original on March 24, 2018. Retrieved December 25, 2018. ^ "Televagelist thanks Jesus for $36M private jet he uses to avoid demons". The Maven. This page was last edited on 18 March 2019, at 20:49 (UTC).